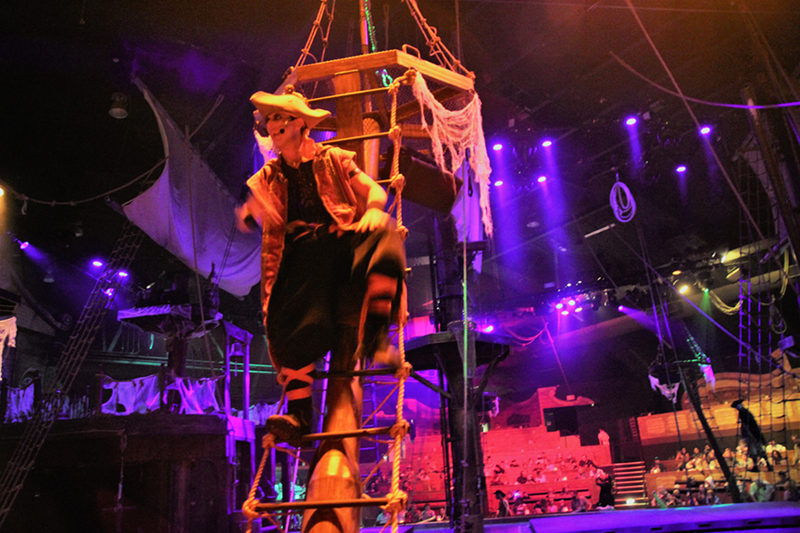 Vampirates - the annual Halloween-themed spin on Pirates Dinner Adventure in Buena Park - is a captivating piece of robust dinner theatre, packing its cannons with enough stunts, songs, and comedy to blast audiences to Davy Jones' locker and back again. Hollywood Gothique loved last year's bloody excursion onto the high seas, but we were uncertain about taking a second voyage, fearing that familiarity would dampen the fun. Fortunately, we were wrong, and our second passage aboard Captain Black's vampire-infested galleon was as thrilling as the first. If you read our Vampirates 2017 Review (click here), you know what to expect, but Vampirates 2018 overturns expectations with a few surprises A repeat viewer might need photographic recall to note the precise changes, but there are moments that leave one wondering, "Is that what happened last year? Didn't they do that other thing...?" A vampirate addresses his cheering section. Perhaps more important than any alterations is the interactive nature of the show. There literally is no fourth wall to obliterate; the only thing separating the pirate ship from the surrounding seats is an artificial lagoon - which is repeatedly bridged by vampirates swinging on ropes to confer with their cheering sections. During the pre-show, before entering the main theatre, the audience is divided and assigned to these color-coded sections, one for each member of Captain Black's crew; viewers root for and even assist their pirate during the contest to determine which vampire draws first blood from their lovely female captive. It's a little bit like cheering on your favorite sports figure at a track meet. There is also some fun for younger viewers: mid-show, several children climb aboard ship and swear an oath to Captain Black, while the goofball Purple Pirate mimes dance moves for them to duplicate. This interactivity closes the distance between the audience and the onstage action, creating a more immediate experience with a different vibe for each performance. By now you know that Vampirates Dinner Adventure provides vampirates and adventure but what about dinner? No seaweed and coconuts here - the kitchen provides excellent meals, and the cooks can handle various dietary needs without sacrificing flavor, turning out an excellent vegetarian pasta. (Carnivores can sate their hunger on chicken and shrimp.) The salads are crisp with good dressing, and the desert cake is tasty if a trifle small. Are only complaint is that the broth in the tomato soup is meat-based, which makes little sense, since tomatoes can supply all the necessary flavor. Customers are encouraged to arrive ninety minutes early, to enjoy the pre-show, visit the gift shop, and have a few drinks. Sitting in the themed interior, with its Halloween overlay, customers can imbibe specialty drinks, such as The Crypt Keeper. We have knocked back more than a few flagons of grog while awaiting the arrival of the Vampirates, and we recommend them all, especially the Parrot Punch, a drink whose fruity flavor disguises its alcoholic content, making it dangerous for the unwary drinker. These drinks costs $18 ($10 for refills), but the Pirates Dinner Adventure glass is included with the price. Vampire Hunters and Vampirates fight to the death. Vampirates takes audiences on a voyage to supernatural seas that is far more enjoyable than the last four Pirates of the Caribbean films. * Despite the blood-thirsty characters, there is nothing horrific; the kid-friendly antics are more rousing than terrifying, providing Halloween fun for the whole family. The athleticism of the cast is amazing - simply watching them is exhausting. Even more impressive, these are clearly not stunt people and martial artists faking their way through a performance; everyone seems able to fight, sing, and act with equal aplomb. 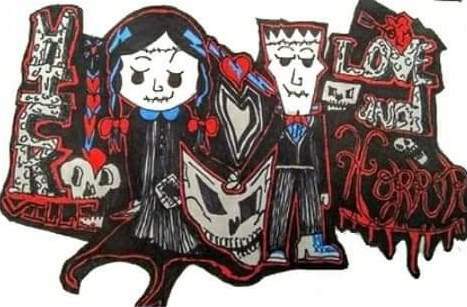 As we often note, there is more to Halloween than haunted houses and hayrides. There are myriad great Halloween Tours and Shows, and Vampirates Dinner Adventure ranks among the best. Yes, this is dinner theatre, an unpretentious piece of pop entertainment designed to sell souvenirs and booze, and the story line acts to some extent as an excuse to link together the songs, stunts, and sword fights. But who cares when the result is so much fun? For the mathematically inclined, that would add up to every Pirates of the Caribbean film except the original. 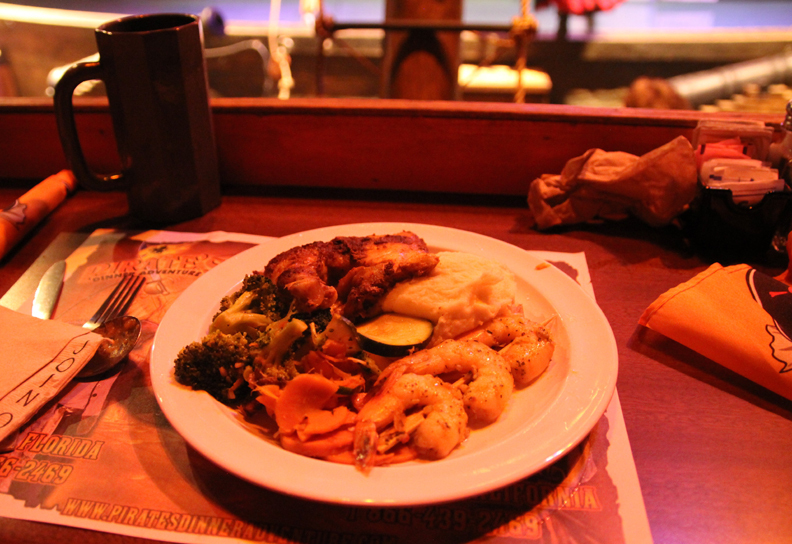 Vampirates Dinner Adventure offers great entertainment, great drinks, and great food. But we’re knocking a half-point off the Dinner Rating for using meat broth in their tomato soup – who needs it? 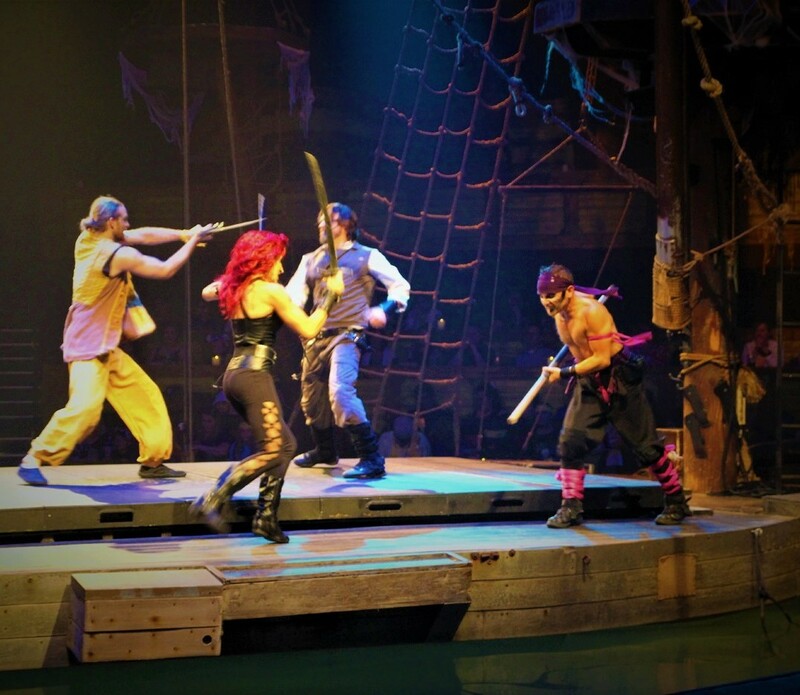 Vampirates runs daily at the Pirates Dinner Adventure through October 31. Hours are 7pm Monday through Friday; 5pm & 8pm Saturdays; 3:30pm & 6:30pm Sundays. Special hours on October 16 &31: 5pm (call for availability). 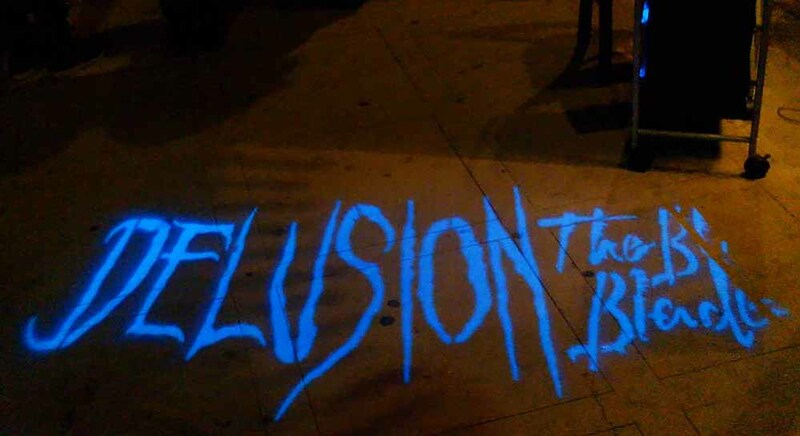 The address is 7600 Beach Boulevard, Buena Park, 90620. Call (714) 690-1497 for more information, or visit: piratesdinneradventureca.com/vampirates. Mention the code V-GOTHIQUE18 at the time of purchase for a discount.